A couple of packs of Cofresh Hummus Chips and Lentil Chips, some Lazy Days Foods Millionaire’s Shortbread which is becoming a staple giveaway of mine since I can no longer trust myself with it, a packet of Co-operative Truly Irresistible berry & seed mix which may sound boring, but when I found myself devouring an entire pack of it in one go I knew it was something special. When I was in Hay-on-Wye and bought my chili sauces from Fat Man Chilli I immediately knew I had to get the Chilli & Cranberry sauce for Christina as it is perfect for barbecues on the beach or to spice up a Sunday roast. For a more personal touch I wanted to put something weirdly healthy in there, so I picked up a Ploughshares raw orange and ginger slice which I had never seen before and looked quite good. Lastly, I threw in a couple of lollipops because I thought if anyone would appreciate their monochrome swirliness it would be Christina, and a couple of crazy teabags a friend brought me back from Greece. 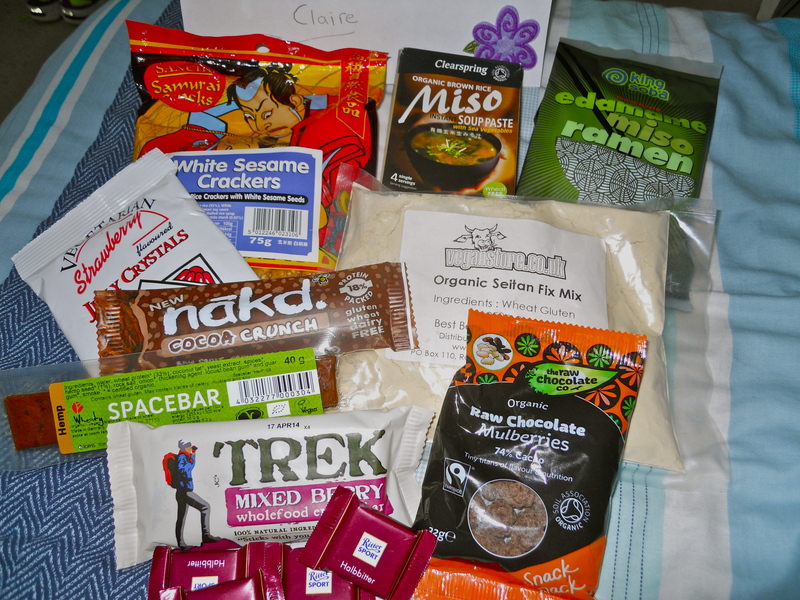 Whenever I send a package to anyone who is a “more experienced” vegan blogger, or anyone at all in Brighton, I get a little nervous that I will be sending them things they see everywhere and that don’t excite them, so I was delighted by Christina’s lovely and glowing write-up of her parcel! Now, I as usual got a lovely parcel but what surprised me is that it was absolutely perfect for me – without having actually sent Rachel my blog link! Rachel got me a great mix of things – some old favourites that I never get myself, some I had never seen before, and a couple I had been dying to try but never treated myself to! In the usual suspects corner we have a Trek Mixed Berry Bar, a Wheaty Spacebar, and a Nakd Cocoa Crunch bar – all perfect for me as I had run out of healthy on-the-go snack bar treats! The little mini-squares of semisweet RitterSport chocolate will be great to pop into my bag too instead of the usual half-open packets that often end up crushed and melted! I was super excited about the Raw Chocolate Company Raw Chocolate Mulberries – I fell in love with raw chocolate a couple of years ago, and only discovered dried mulberries about a year ago – and ever since, I think Ben can testify that every time I get within grabbing range of a bag of these I pick them up, look at them, have a good long think about the price tag vs how long the bag would last within my reach, and put them back. Indeed – the bag didn’t make it through the evening, and having only opened my parcel in the afternoon, you could say it only survived about four hours. And they were every bit as good as I had hoped and expected – chewy, rich but not overly sweet, mature but fun – henceforth one of my favourite healthy treats! I’ve also heard a lot about the Seitan Fix Mix, namely from Isa Chandra Moskowitz and her many enticing recipes. I could just make seitan, but I might jump straight in and make some sort of sausage. I will keep you posted (if it turns out well – if it doesn’t, I will eat it all to destroy the evidence). I’m strangely excited about the King Soba Edamame Miso Ramen – I am sure they have caught my eye before as I love the packaging, I am always intrigued by soba noodles, I love instant noodle packages (goes back to my pre-teen years), and I have an unhealthy addiction to edamame. As my eating habits, training intensity, and evening mealtime can be somewhat unpredictable, these will be perfect for those nights when I am not hungry and am feeling lazy but craving easy comfort food. Same goes for the Clearspring Miso Soup sachets – I used to love having these in uni when I had just had too many cups of tea and needed something with a little more substance. They will be perfect for those strange and random savoury snack attacks when I have already eaten too much and just need a hit of saltiness and warmth, especially as the summer trickles away. Oh and they are the version with sea vegetables – sold! I’m not much of a savoury snacker but those Sanchi White Sesame Crackers look awesome! I normally find that crispy savoury snacks leave me feeling greasy and thirsty, but these look like they would do a good job of giving me some wholesome sustenance when I need a crunch. Perfect. Last but not least – I am going to have some fun with those Just Wholefoods Vegetarian Strawberry Jelly Crystals… And for once I should be able to concoct Ben-friendly desserts! Plus, I totally need to use those before summer is over, to enjoy the full fruity jelly experience, right? 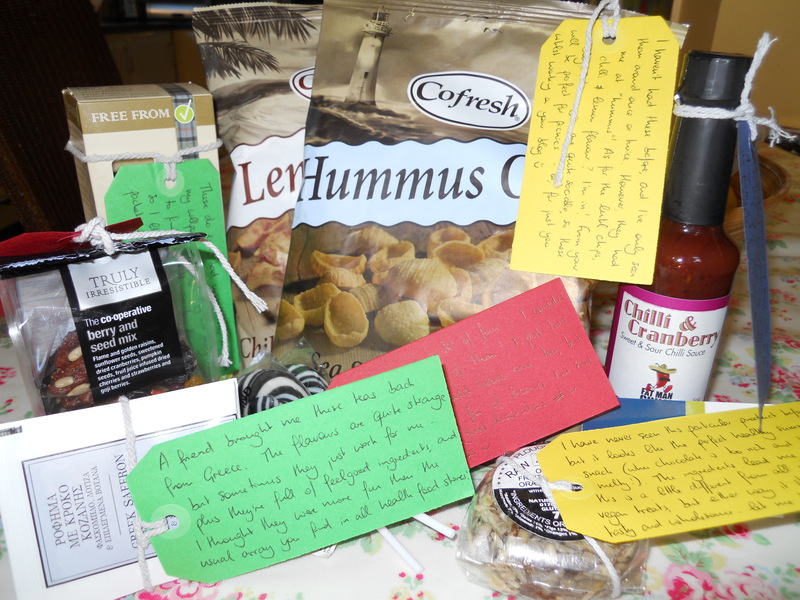 All in all, another wonderful package – thank you Rachel! I know I say it every time but I can’t emphasise enough how much I love the UK Vegan Food Swap. Thanks again to Mitsu and Sasha for organising it, and if you haven’t signed up yet, make sure you do so in the next couple of weeks so you can get involved in the September deliciousness! August is my second month on the swap – I know what you mean about it being a little nerve-wracking. I really want my partners to enjoy their parcels! Hello! This has made my little day 😀 (It’s Rachel btw).